CHANDLER, Ariz. -- A self-driving SUV operated by Waymo was involved in a collision in Chandler, Arizona, authorities said in a statement Friday. They said a Honda sedan swerved to avoid hitting another vehicle but ended up striking the Waymo SUV. The vehicle was in autonomous mode but there was an occupant in the driver's seat who suffered minor injuries, police said. 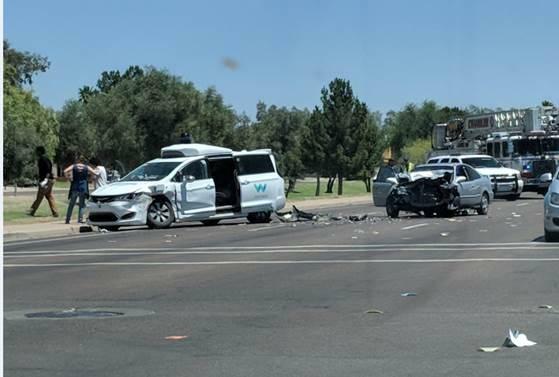 Chandler Police Department spokesperson Seth Tyler said the Waymo vehicle was in the wrong place at the wrong time and would not be considered at fault, as Arizona is a no fault state. He said the vehicle was traveling westbound as it approached an intersection and the Honda sedan was traveling eastbound. The Honda swerved to avoid a vehicle traveling northbound that entered the intersection. The Honda ended up in the westbound lanes and struck the Waymo SUV. An investigation is underway and police said they intend on reviewing the vehicle's on-board cameras to help determine who ran the red light. Video from the scene showed both vehicles on flatbed tow trucks, CBS Phoenix affiliate KPHO-TV reports. The safety of self-driving vehicles has recently come under greater scrutiny. In March, a self-driving Uber vehicle fatally struck a woman as she was crossed a street in Tempe, the first pedestrian fatality linked to a self-driving vehicle. Gov. Doug Ducey then suspended Uber's ability to test self-driving vehicles on roadways in Arizona, specifically citing the fatal crash in his decision. Waymo, Google's self-driving vehicle project, did not immediately respond to CBS News' request for comment.